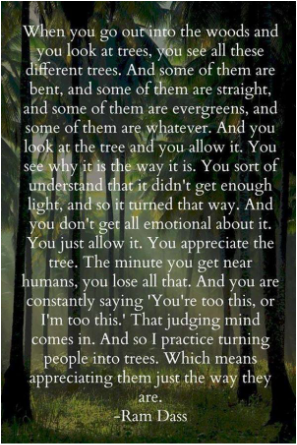 Author and teacher Ram Das used his mind/imagination to turn people into trees. You can use your mind in any way you choose. There's a famous apocryphal punchline about Barbara Walters asking guests what kind of tree they would be if they were a tree. The reality is, that tree comment came up during a 1981 interview with Katharine Hepburn. It was Ms. Hepburn who actually described herself as 'feeling like a very strong tree in her old age'. Ms Walters then followed up with: "what kind of tree are you?" Katharine Hepburn said she'd rather be an oak than an elm to avoid Dutch elm disease. It's a great line and an even better thought! Katharine Hepburn knew the secret! Thoughts create things! And since you always get to choose what you think why not go for the best thought you can have! If you're tired of being a weeping willow, imagine yourself as a Redwood....or anything else you'd rather​ be. Maybe you'd like the strong oak concept or maybe you'd prefer to be a brilliant sugar maple. Only you can decide what you want to think. Go ahead, think of the tree you'd most like to be. What's going right for your tree? What are its finest features? What do you admire most about this tree? Become your tree....just there...in your imagination. Notice what it makes you think. You're feeling pretty good aren't you?!! That's one effective technique to Re-Mind Yourself! Incorporate any metaphor you'd like. Accidentally we find ourselves in negative places sometimes. Now, on purpose and consciously, you can use the power of your mind/imagination to take yourself into a better thinking and feeling place.